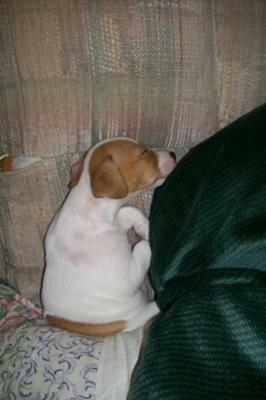 He's a 3 months old JRT. We got him so he can be a companion to our female 8 month old JRT. They love each other and he always sleeps weird. Tater is adorable! We also have an eight month old Jack Russell (F) and we want her to have a companion because she just loves to play with other dogs. How did you introduce them? Did Tater understand the hierarchy right away? Was your other dog at al jealous? Do they nap/sleep together? Please let me know, if you have time to answer.